With equity indexes still broadly climbing, the VIX continued to cool, settling lower for a fifth consecutive day, -1.0% @ 12.35 - the lowest level since early December. Across the week, the VIX declined by a significant -11.1%. The US equity market remains extremely complacent, with no concerns about anything... not even a potential GREXIT. 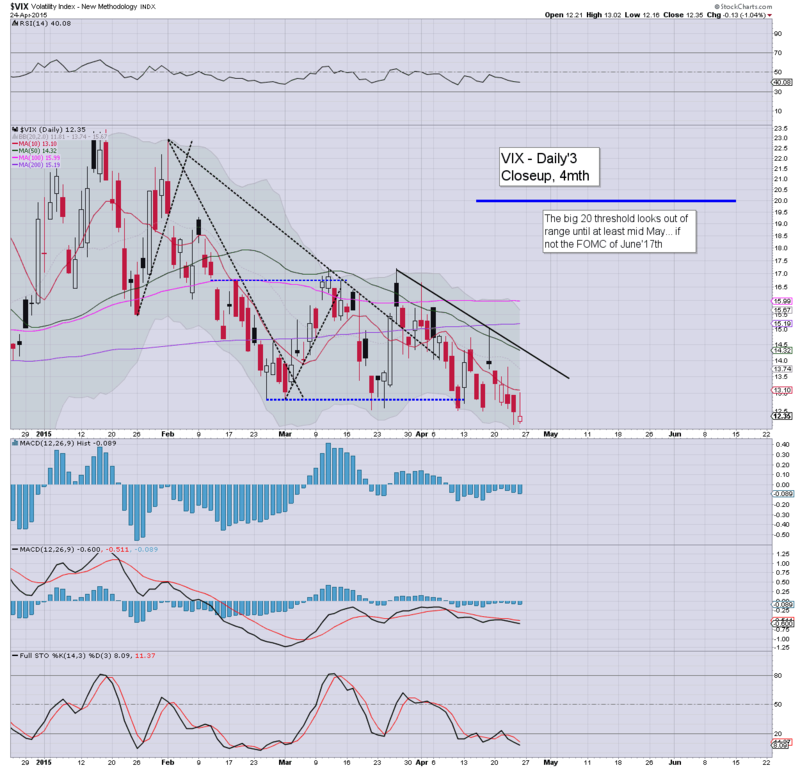 VIX looks set to remain subdued into mid May... if not early June. The next likely opportunity for a VIX spike looks to be around the FOMC of June 17th. US equity indexes closed a little higher, sp +4pts @ 2117. The two leaders - Trans/R2K, both settled lower by -0.3%. Near term outlook remains bullish into May. Precious metals were weak, with Gold -$16, and Silver -1.0%. Oil closed -0.4%. ... and another week in the worlds most twisted casino (yes, even more than Wynn resorts)... comes to a close. The broader market is increasingly pleased with itself as earnings come in 'reasonable', along with continuing stock buy backs in many companies. There is simply little reason why equity bears can have much hope until the FOMC of mid June... which remains the first opportunity for rate rise.. although that is admitiddly increasinly unlikely. 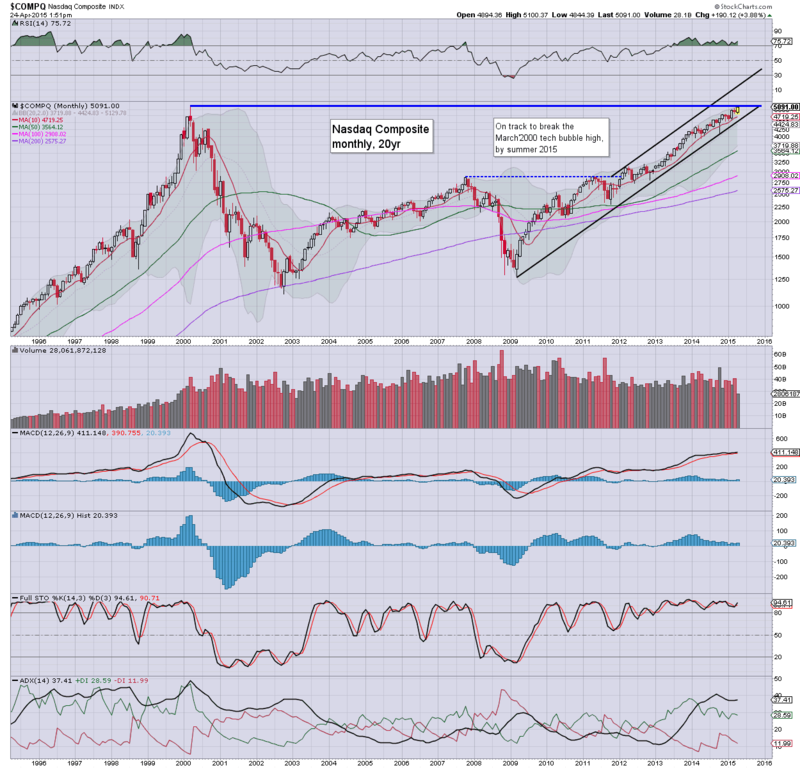 Regardless of the exact close (even a moderately negative one), it has been a week for the bull maniacs, with new highs in the sp'500, NYSE comp', and most notably.. the Nasdaq comp'. 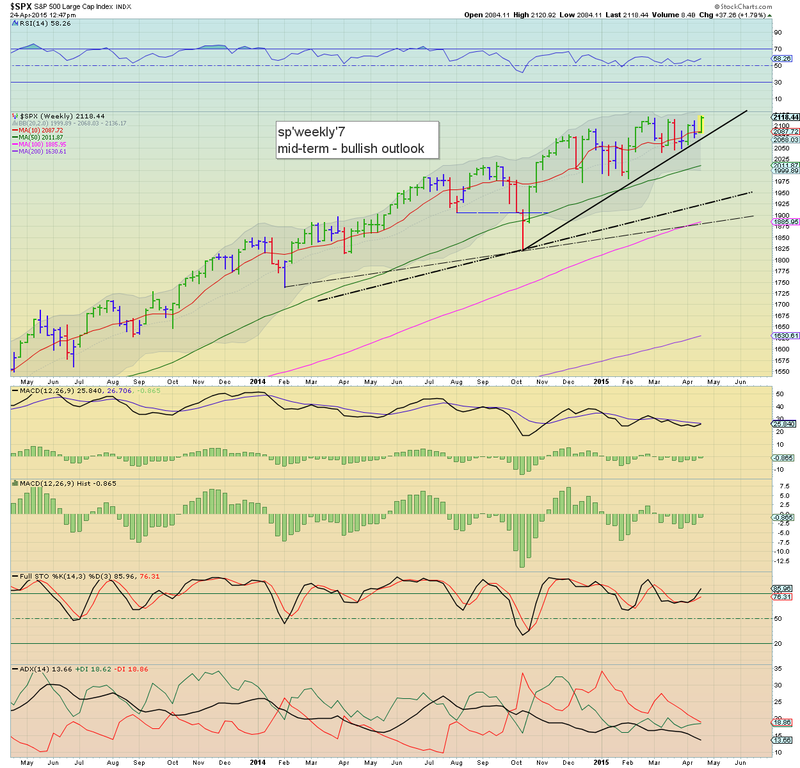 Near term outlook is bullish into next month... the giant monthly cycle will be offering the sp'2200s by late May. All indexes at/close to highs.. with a VIX crushed in the low 12s. 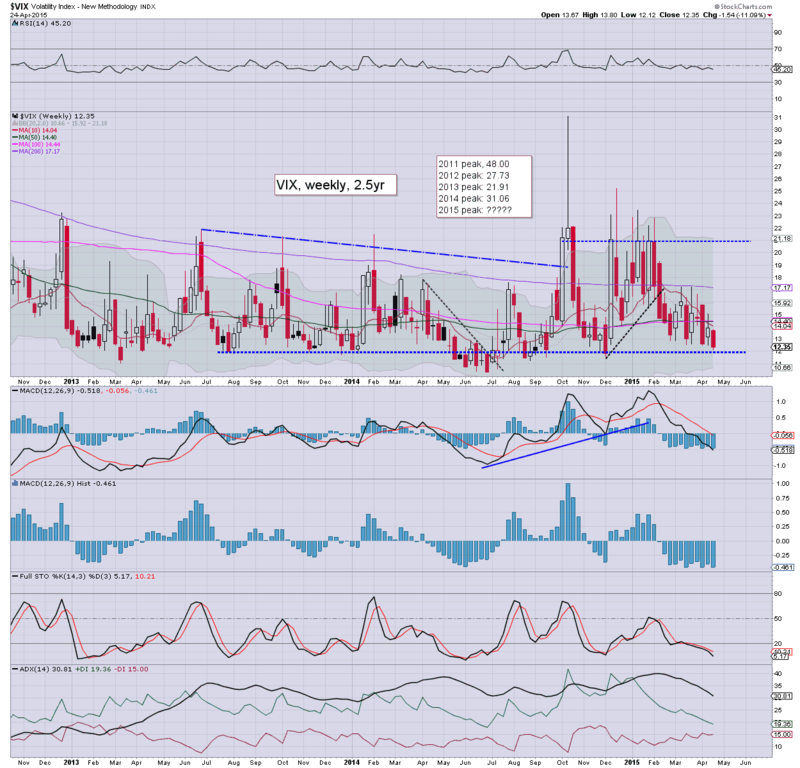 Indeed, be mindful of a closing minutes hammer-whack in the VIX, which might result in a weekly close in the 11s. *Barring a bizarre spike higher into the close, I will hold long-oil across the weekend, seeking an exit in the WTIC $59/60 zone... but with broader upside target of 67/75 by July/August. Hourly MACD cycle is set to turn higher early Monday. 3.02pm... notable weakness, TWTR -1.6%.... not sure why... maybe just minor concerns pre-earnings (next Tues, AH). 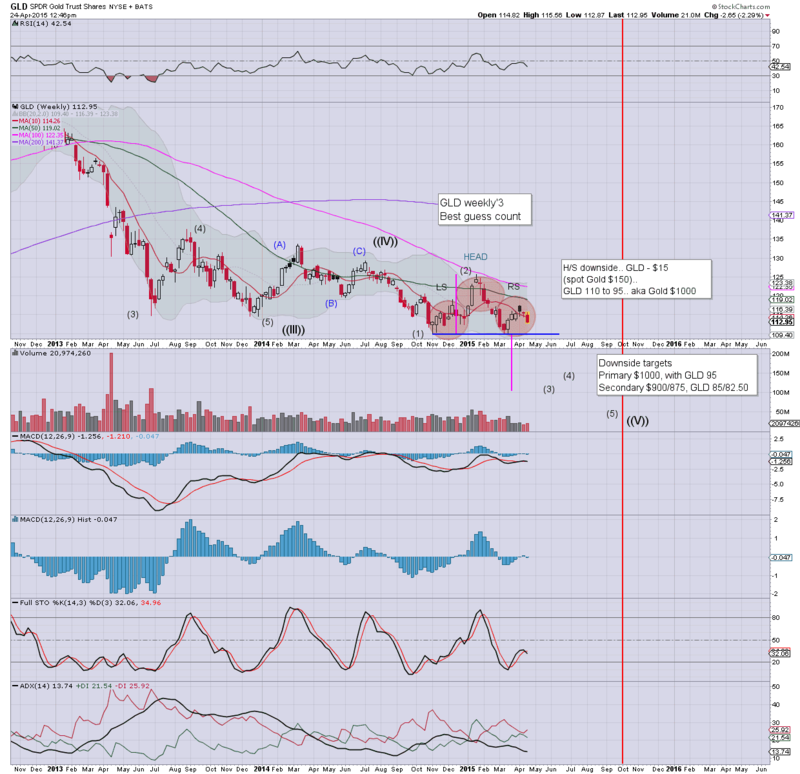 I'd be surprised if TWTR is sustainably trading <$50 next Mon/Tue. The Nasdaq composite is getting real close to taking out the tech bubble high of March 2000 of 5132. A monthly close in the 5200s now looks likely in May/June... which will have rather major implications for the broader market into the late summer/early autumn. As some might agree... it is.. what it is. Clearly, 5132 won't be broken today, but it looks probable by next Thursday/end-month. Pretty incredible really, but what really matters is what it implies for the broader market. I've been highlighting that for months... but I won't go over that again this hour. Notable strength: BABA +3.1%... no doubt getting a little help via the gains in the grossly mis-priced AMZN. 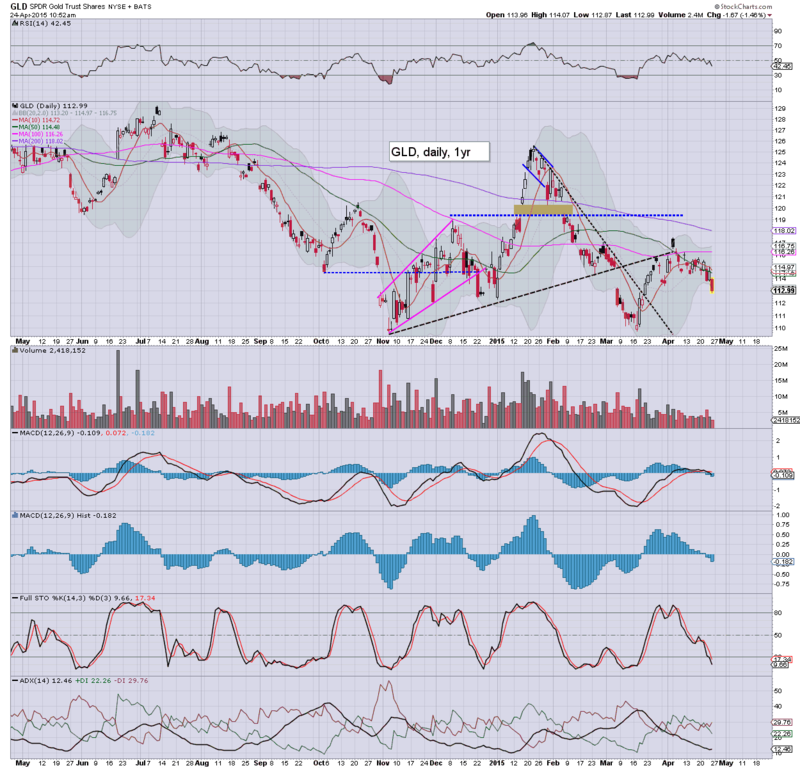 There is strong support in the $81/80 zone... it would seem BABA will be trading in the gap zone at next earnings. 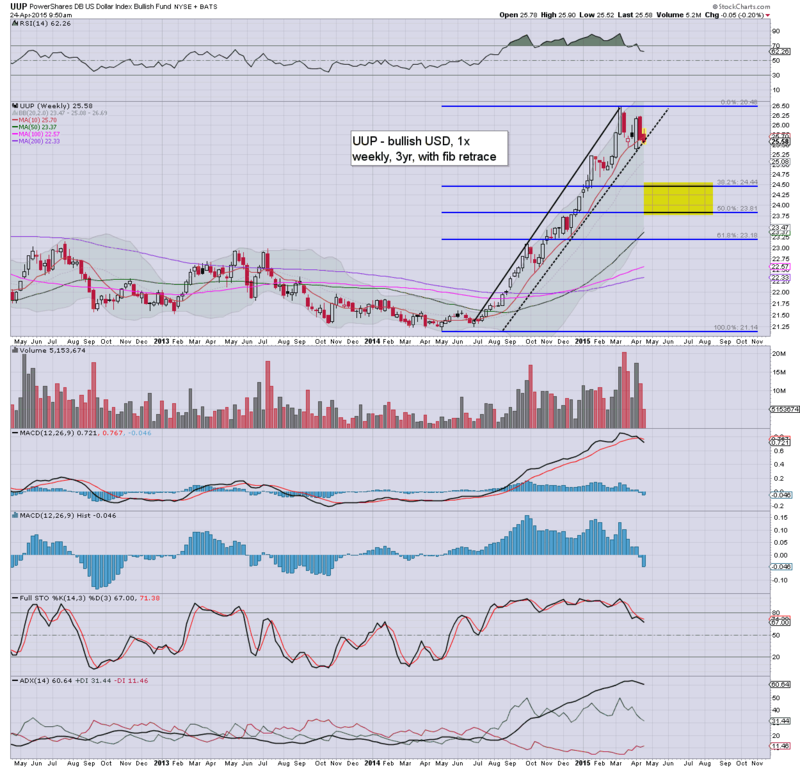 Whether it can break above the big $100 threshold... difficult to say. What is clear.. unlike AMZN, BABA makes a huge profit, and looks fine in the near/mid term. 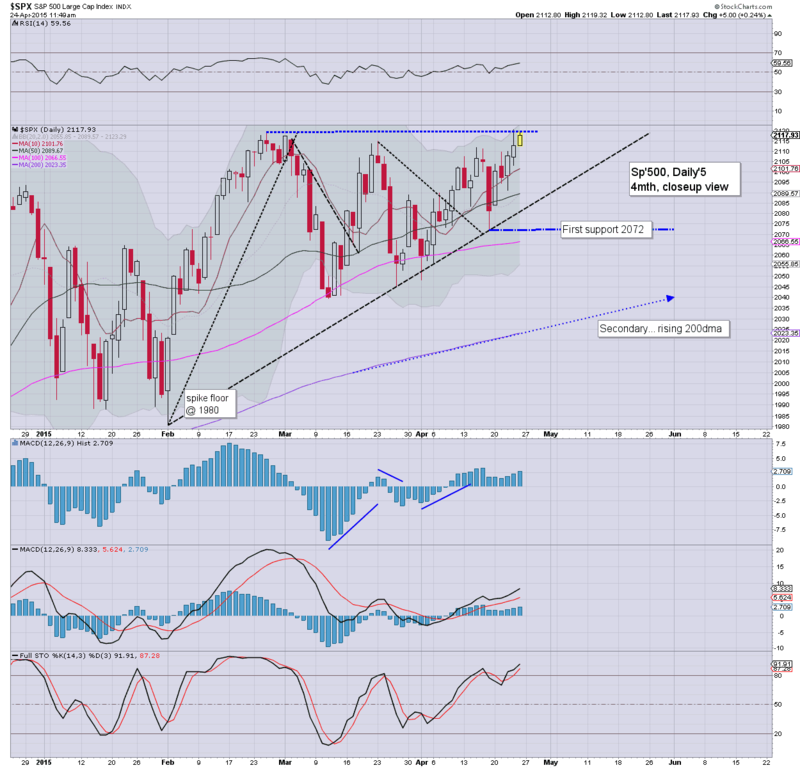 US equity indexes are holding moderate gains, with the sp' having broken a fractional new historic high of 2120.92. Metals remain very weak (especially when considering the weaker USD)... Gold -$17, with Silver -1.2%. Oil is still moderately weak, -0.8%, but already showing signs that a floor is in. We have an outright bullish green candle on the weekly 'rainbow' chart for the sp'500.... the upper weekly bollinger will be offering the 2140s in early May. As for Gold/Silver, both have a classic large H/S formation. If correct, Gold is set for the giant $1000 threshold this summer.. and that has rather dire implications for the mining stocks. 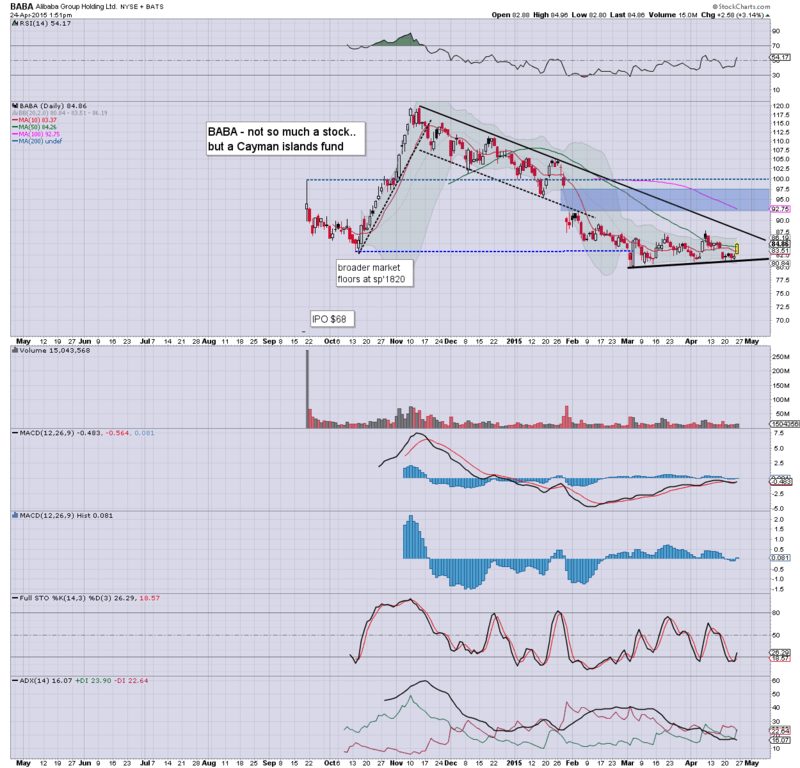 notable strength: BABA +2.7%.. looks set for the mid $90s by mid May. *I remain long Oil... will consider an exit into the weekend if USO $19.90s.. or higher. In any case, WTIC Oil is headed for $60.. if not $67/75. Most US indexes are holding minor gains, and it remains a case of underlying upward pressure... not least as earnings continue to come in 'reasonable'. Metals are significantly lower, Gold -$16, with Silver -1.1%. Oil is weak, -1.0%, but liable to turn positive by the close. 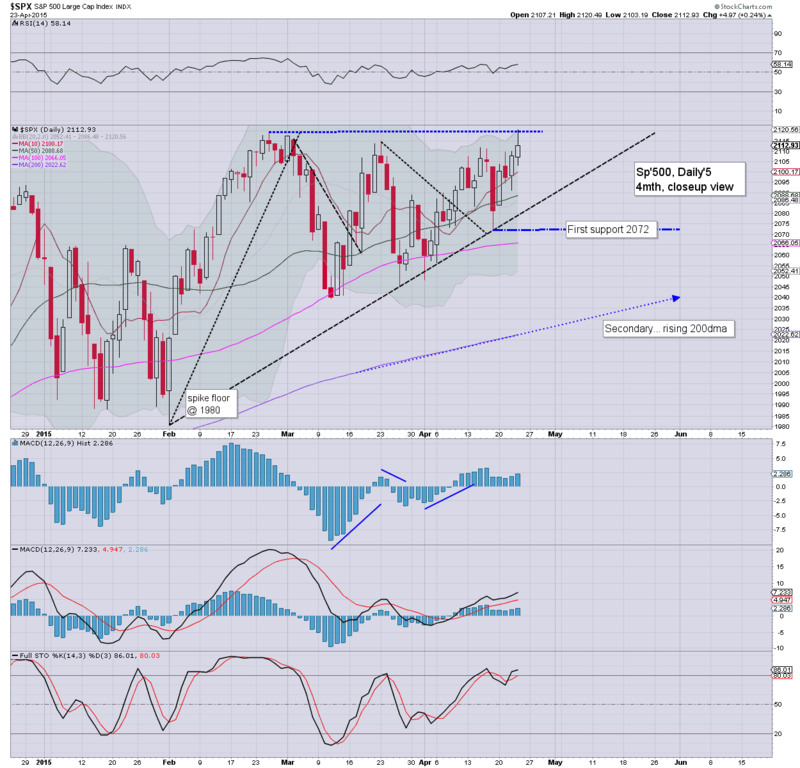 Friday looks set for net daily gains for most indexes, which will make for a rather significant net weekly gain. The sp'2130s look within easy range next week. re: Oil... hourly cycle will likely turn upward into weekly close.. and I will be more than content to hold long across the weekend. For me, its mostly about the weaker USD.. that is in the process of breaking the upward trend from last May. US equity indexes are a little mixed, with a fractionally red Dow/Trans/R2K, but with gains in the sp'500 and Nasdaq. With the USD -0.3% @ DXY 97.00, the metals are looking especially weak, Gold -$17... set to take out the Nov' low of $1130. Oil is similarly weak, -1.3%, but will likely turn positive by the close. *the precious metals are indeed particularly weak, considering the moderately lower USD. Price structure for Gold/Silver remains a very bearish H/S formation, which is highly suggestive of strong downside into the early summer. The $1000 threshold looks... highly probable. Such an outlook.. if correct, bodes badly for the mining stocks. So.. it is a bit of a mixed Friday, but overall.. equity indexes are set for sig' net weekly gains.. and frankly.. that is what matters.. not the intraday.... least of all.. morning weakness. notable strength: copper miners, FCX/TCK, both higher by around 4%.. which is impressive, considering the Gold/Silver declines. So, we're a little higher... if somewhat choppy. Overall, bull maniacs have little to be concerned about as the weekly/monthly cycles remain bullish... not least supported by EU/Asia markets. *I added to an Oil-long position at the open... still seeking a move into the WTIC $60s within the near term. A Q4 loss of -12 cents, but hey... in this market... profits don't matter. 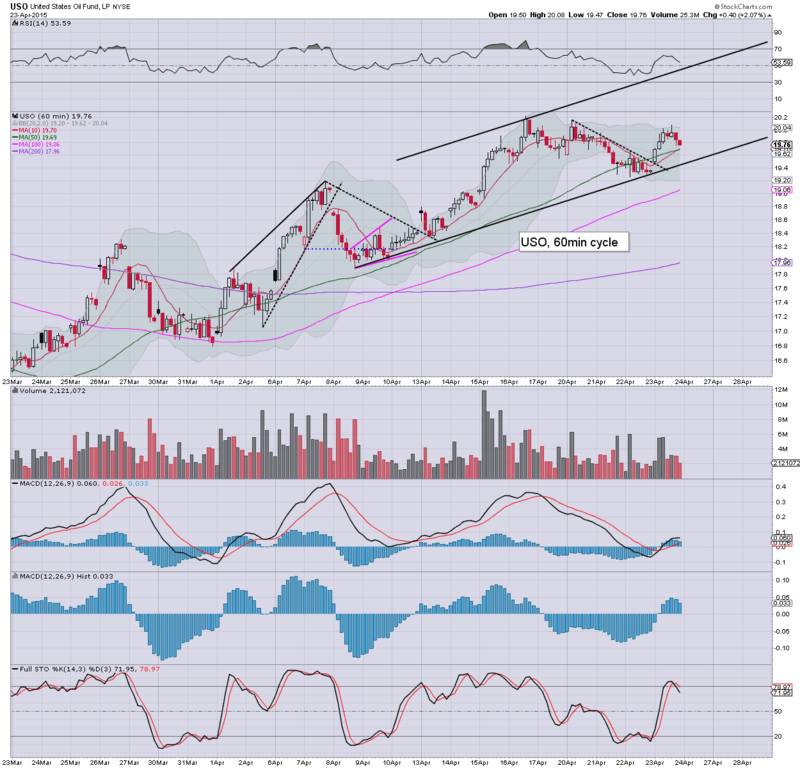 Naturally, mainstream talk will now turn to the big $500 threshold... which seems possible in late May/June. I can only imagine what those short the stock - via option puts, are thinking, having seen the stock swing in AH from 420 to 371... only to see if open in the $440s. Urghhh. Good morning. Futures are a little higher, sp +2pts, we're set to open at 2114. Metals have resumed lower, Gold -$7, with Silver -0.8%. 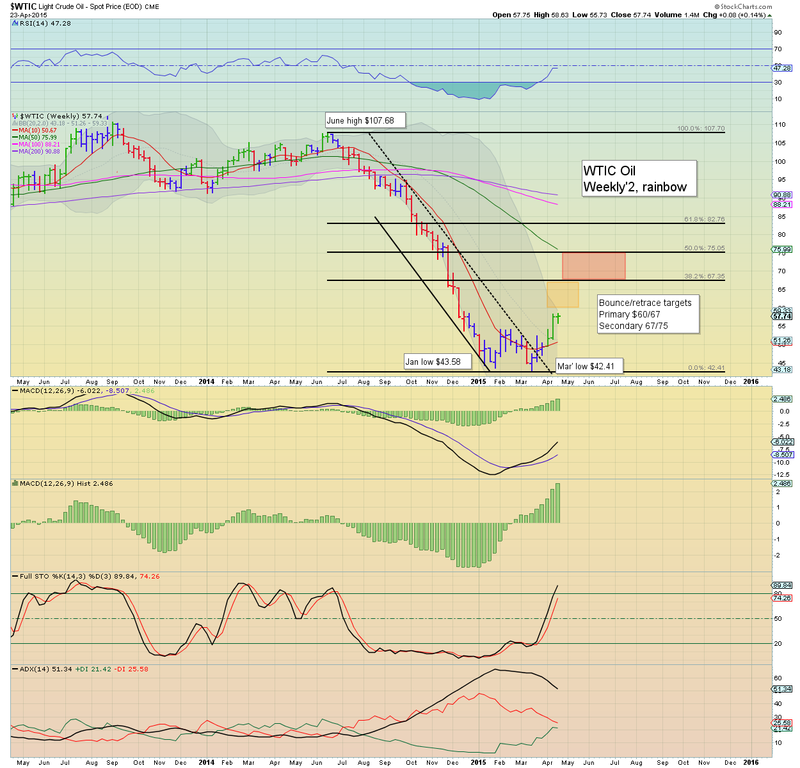 Oil is u/c, but will likely claw higher into the weekly close. So... we're set to open a touch higher. 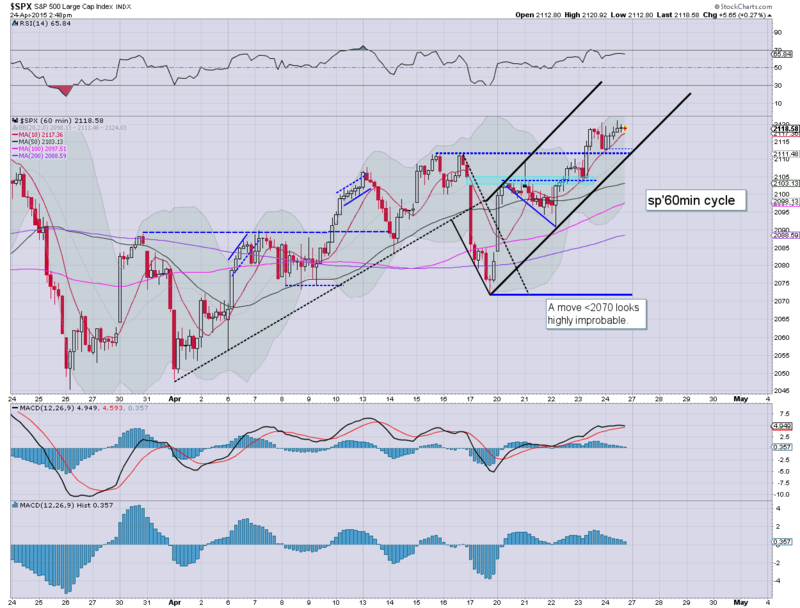 Certainly.. a weekly close in the in the 2120s is very possible.. if not likely. 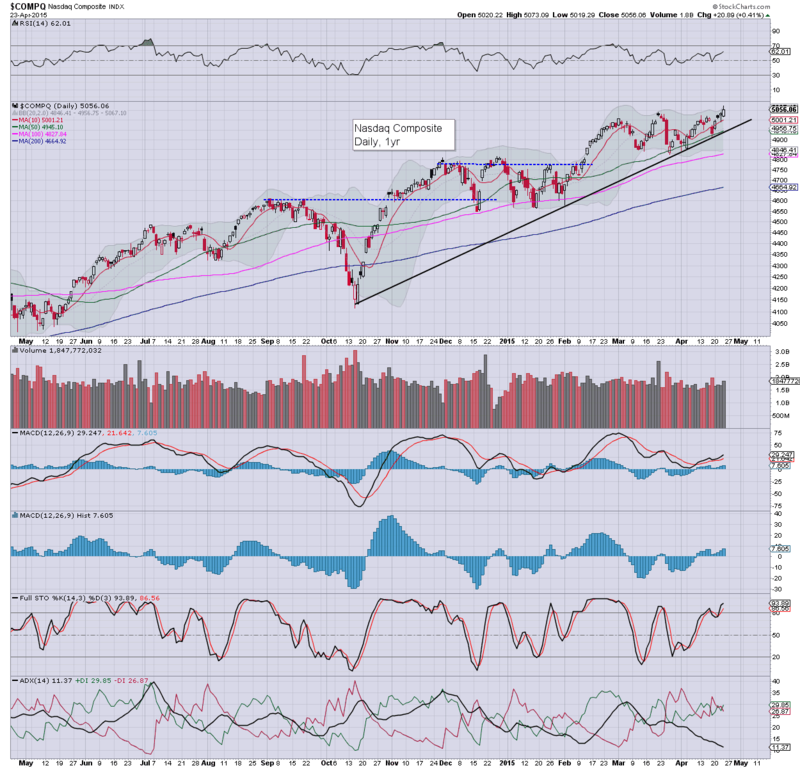 Overall, market looks set for sig' net weekly gains of around 1.5-2.0% for most indexes... as lead by the Nasdaq comp. re: Oil. 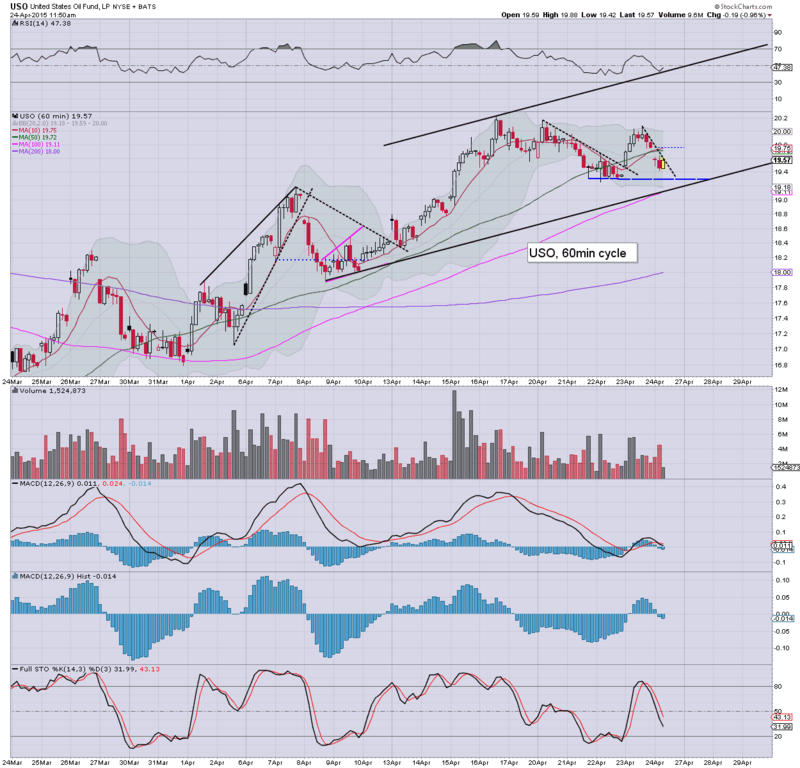 I remain long - via USO, am seeking the $21s.. with WTIC in the low $60s within the next few weeks. **It is highly notable that in overnight trading, the USD cooled to DXY 96.90, which is an absolutely clear break of rising trend from last May. Regardless of the exact weekly close, USD is in the process of retracing. AMZN +12% @ $439... having swung wildy in Thursday AH from 390 to 420, then 371... and now at new highs. Absolutely incredible, and a gross mis-pricing... having yet another earnings loss of -12 cents. Just consider that AMZN has sales of over $60bn...and still can't make a profit. The point remains, earnings for Q4 have come in 'reasonable'.. hence there is simply no reason why the market can't just continue to battle higher. The fact many companies are buying back their own stock only makes things that bit extra bullish. 8.32am. Durable goods orders... 4.0%.. much better than expected. However, ex-transports, -0.2%.. not so good. The US Dollar settled lower by -0.7% @ DXY 97.49. The broader upward trend that stretches back to last May is now in the process of being broken. There are a great many implications to the USD retracing/cooling lower into the summer, not least of which would be higher Oil prices. A retrace to the DXY 93/92 zone looks very probable. Secondary downside target is around 90/89. That will be difficult to hit, unless the USD falls rather quickly across May/June. I would imagine a retrace will take no longer than 3-4 months.. and we've already seen a good 6 weeks since the peak of 100.71. Whether we floor in the 93s, 92s.. or even 90/89... is of little importance. What will be critical is the subsequent hyper-ramp to the 120s.. which might occur before year end. Such a jump would be a major market shock.. and probably offer the best chance of an intermediate equity pull back since summer 2011. Right now.. a market 'upset' looks viable in late summer/autumn.. although I realise that has been said by many.. myself included.. in 2012, 13, and 14. 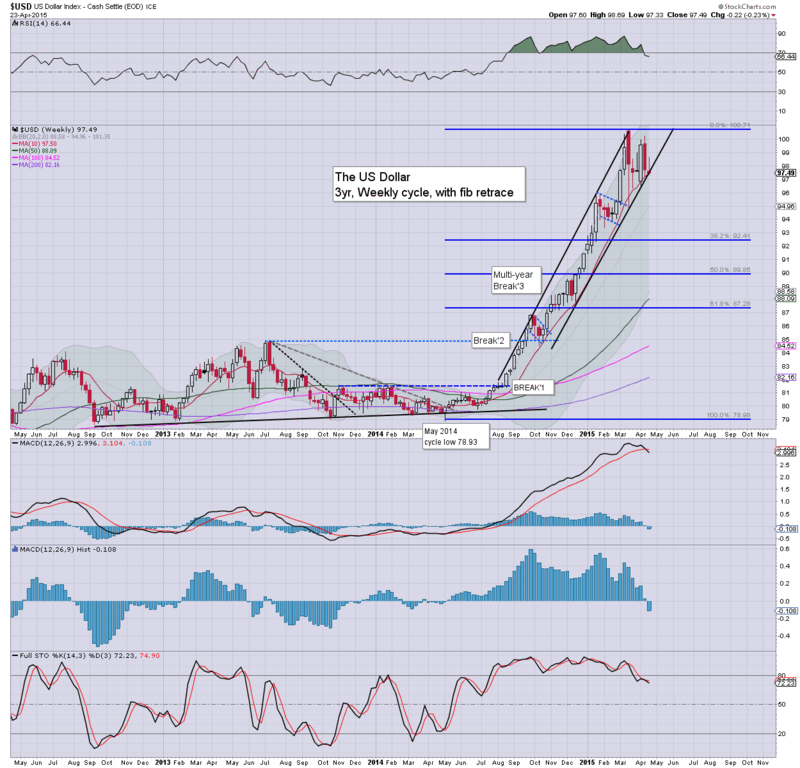 ALL US dollar denominated assets will be at least 'somewhat' pressured higher.. Particularly likely to benefit... WTIC Oil, Equities - esp' energy stocks. Precious metals remain holding a starkly bearish H/S formation, but downside pressure will be somewhat negated by a weaker dollar. If the USD can cool lower into late June/early July - as seems likely, then analysts will likely be revising outlooks - to the upside, for many of the big internationals. That should offer at least the sp'2170/80s.. perhaps 2200s before next chance of a minor 3-5% retrace. Friday will see Durable Goods Orders... other than... that is all ! 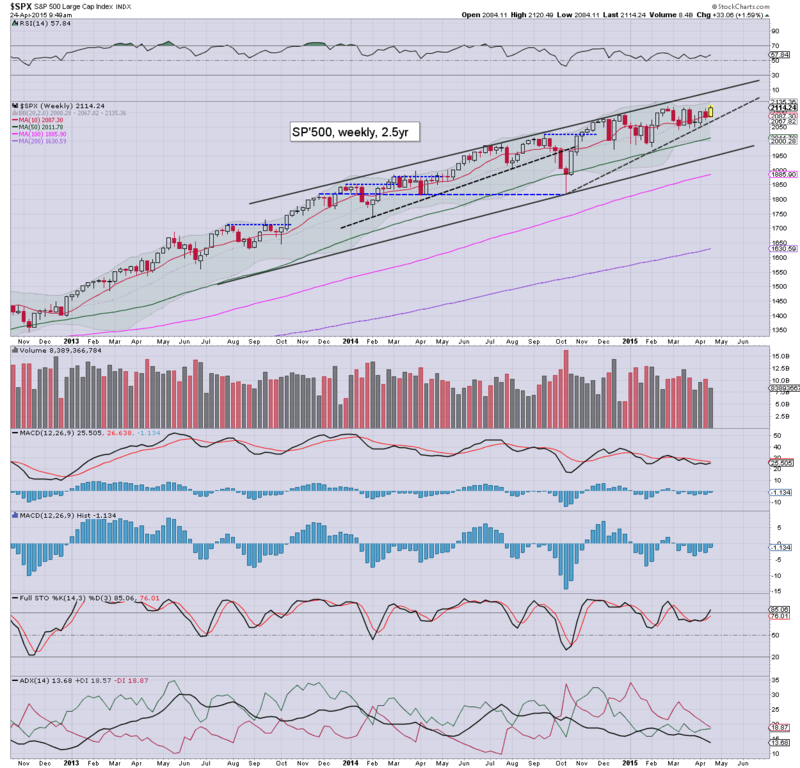 US equities closed moderately higher, sp +4pts @ 2112 (new historic high 2120). The two leaders - Trans/R2K, both settled higher by 0.5%. Near term outlook remains bullish, not least helped by the USD that appears in the process of a key downside break of the upward trend. 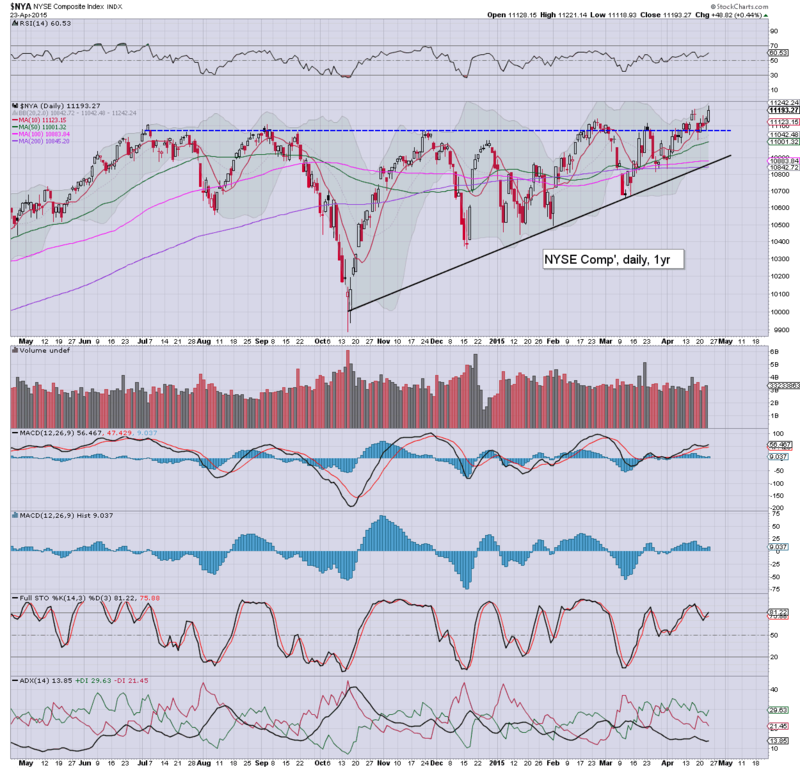 *notable new post 2009 high in the Nasdaq, with a historic high in the 'master index' - NYSE comp', and the sp'500. 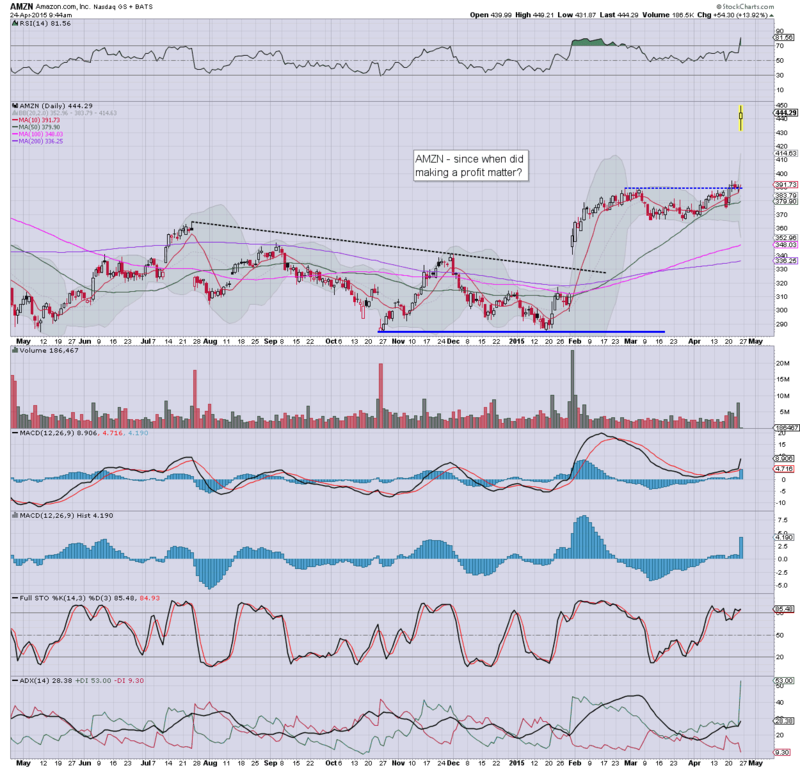 Broader trend remains bullish... as earnings continue to come in 'reasonable'.